Children joined the gathering at the Utah Islamic Center in Sandy over the weekend. 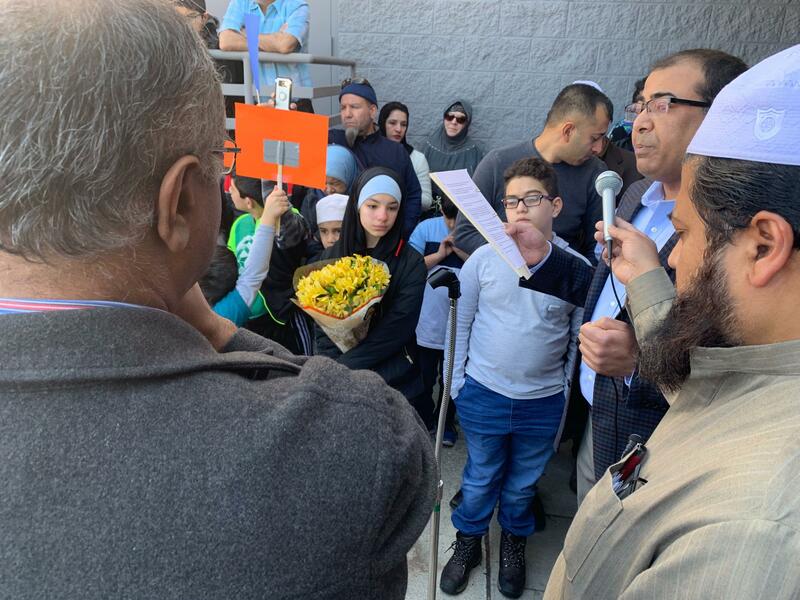 Din called to the 200 or so mostly non-Muslim people gathered Sunday outside the Utah Islamic Center in Sandy to mourn victims of Friday’s mass shooting at two New Zealand mosques and to stand in solidarity with Utah’s Muslim community. 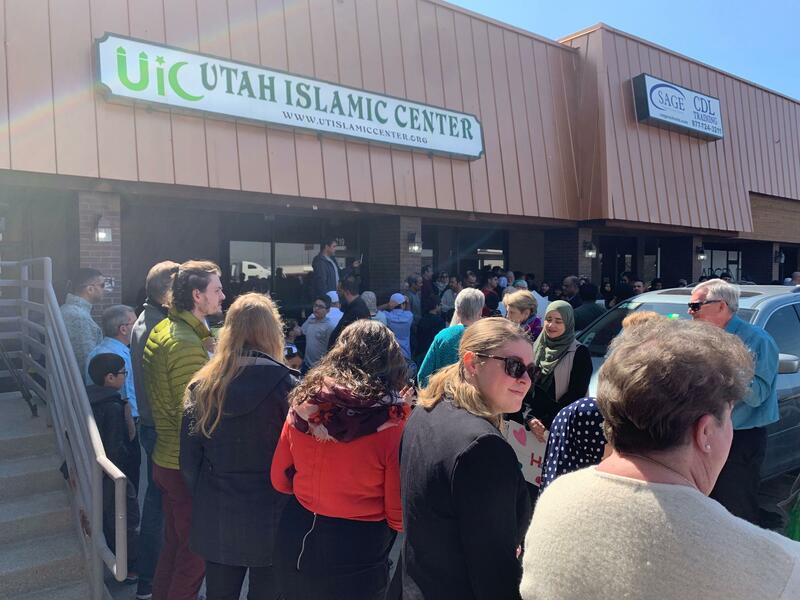 Hundreds of people gathered at the Utah Islamic Center in Draper to mourn victims of the mass shooting at a New Zealand mosque. 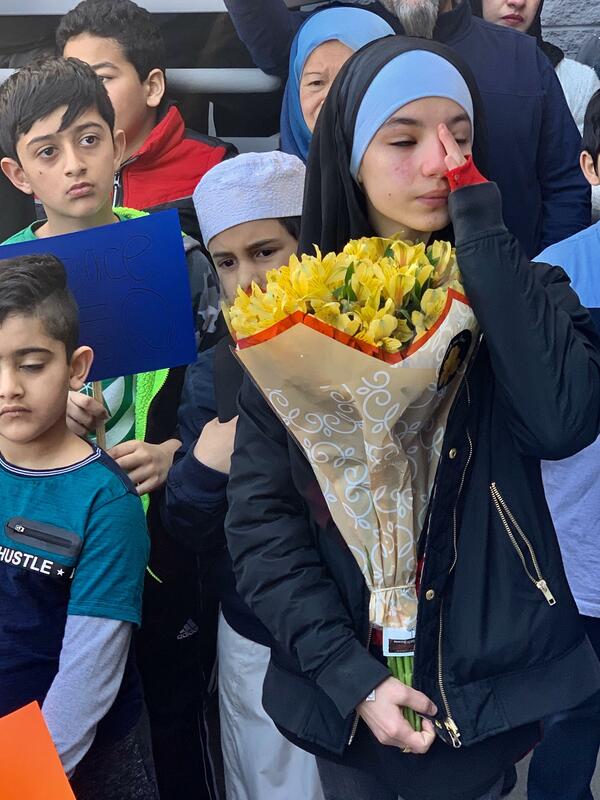 The outpouring of love and grief took place at the temporary strip-mall home of the Islamic center, which serves about 2,000 Muslims living in the southern end of the Salt Lake Valley. Din said the shooter’s actions have caused pain but they are also bringing communities together. As he spoke, a tear rolled down the cheek of a young girl in a hijab carrying a bouquet of yellow freesias. Among the other faith leaders was Rabbi Samuel Spector with Congregation Kol Ami who called for unity. “We will not let hate divide us, but rather this is how we respond when people seek to point out our differences,” he said. Amina Khan, a member of the congregation, read the names of some of the victims, including a 3-year-old. Then leaders opened the microphone to the community. Farukh Usmani attends mosque at the Utah Islamic Center. He spoke at the event urging those who came to speak out against extremism. Farukh Usmani, who attends the mosque, said Utahns cannot be passive and must stand against extremism. “We have to stand and speak up against bigotry, speak up against racism, speak up against xenophobia, Islamophobia, anti-Semitism,” he said. Rep. Suzanne Harrison, D-Draper, who represents parts of Sandy in the Utah Legislature, praised a recently passed hate crimes law. Dawn Armstrong, a member of the Church of Jesus Christ of Latter Day Saints from Draper, said her 18-year-old son recently began a mission near where the shooting took place. Attendees listened tearfully as community members and leaders spoke. Afterward he explained how the events in New Zealand are affecting his congregation. He said it’s easy to feel anger and other emotions, but feelings of anger must not turn into hatred. He added that the outpouring of support is a comfort to the hundreds of Muslims who attend services at the mosque.